Bananas in Ham with Cheese Sauce? Meat Salad made of ground bologna and gelatin? Spend any time on the internet, and you’re bound to come across gross recipes from the past. How did anyone with a single taste bud in their mouth come up with this stuff? 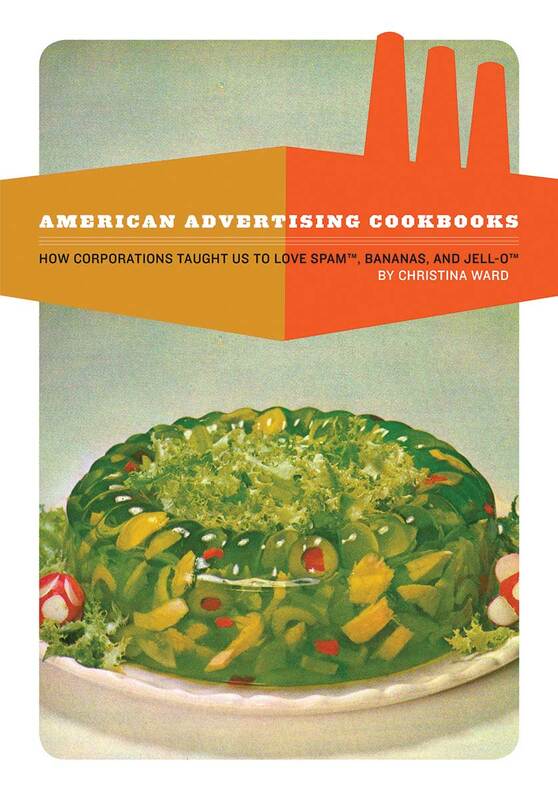 American Advertising Cookbooks: How Corporations Taught Us to Love Spam®, Bananas, and Jell-O® is a deeply researched and entertaining survey of American food history; connecting cultural, social, and geopolitical events. Author Christina Ward (Preservation: The Art & Science of Canning, Fermentation, and Dehydration, Process, 2017) uses her vast collection of cookbooks to tell the fascinating and often infuriating story of corporate greed and advertising and the manipulation of American cuisine. Academic researchers have published histories of American food and politics, but Ward brings all these elements together to tell the larger story of why we eat what we do. Though easy to mock, once you learn the real history, you will never look at Jell-O® the same way again! American Advertising Cookbooks, How Corporations Taught Us To Love Bananas, Spam®, and Jell-O® features full-color images and essays uncovering the origins of favorite foods. Christina is a featured contributor to Serious Eats, Edible Milwaukee, The Milwaukee Journal/Sentinel, Remedy Quarterly, and Runcible Spoon magazines. Christina, despite klutziness, is often found in classrooms and community kitchens with sharp knives, spilling vinegar into unsuspecting handbags while wildly gesticulating as she teaches folks how to make perfect pickles. She is a featured guest food expert on Fox6 News Real Milwaukee and public radio stations across the United States. Christina can trace her Wisconsin roots to the early 1800s. She prides herself on having a hungry mind interested in learning about people, the foods they eat, and the stories that arise from that convergence.